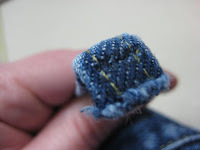 What I'm Altering Today: Have You Tugged on Your Beltloop OneToo Many Times? Have You Tugged on Your Beltloop OneToo Many Times? Those jeans start slipping down a bit, or they fit tightly at the hips. In order to get them up where they belong, we just pull up on the beltloop. How long do you think that beltloop can take such abuse? Well, the stitching is mighty tough...so tough that the jeans will get a hole in them before the stitching will even budge. Now what? First, remove gold stitching from beltloop and pants. Next pick out all the loose threads. 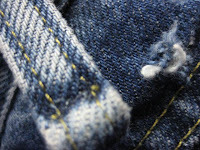 Next, use a mending stitch to mend the hole. Sew back and forth numerous times to fill in the entire hole. You may even need to back it with a scrap of fabric. It's critical that you do this step correctly. 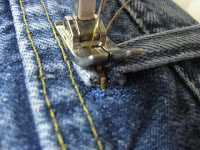 Finally, using your size 18 needle and gold jean thread, stitch the bottom of the loop to the jeans. 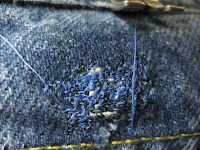 You will be stitching right over top of the hole that you repaired. Now you see why it needs to be secure. 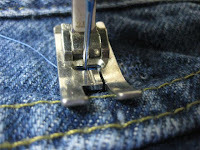 If you've used a good thread match, you'll never see the repair, especially with a belt on. Stayed tuned for the jean hemming photo tomorrow.